Final 2015 Statistics (Now Includes December Data) | Watts Up With That? One of the big stories from 2015 is the record shattering anomalies on the surface temperature data sets for 2015 versus the third ranked satellite anomalies for 2015. The discrepancy between 1998 and 2015 is now larger than it has ever been between the satellites and surface records as can be seen on the graphic above. Compare the blue end points with the red end points. The table below shows the top ten years for the five data sets that I track. “1year” gives the year of the warmest anomaly for that data set and “1ano” gives the anomaly for that year, etc. However. I have included an extra column that I will also discuss, namely GIS5. GIS6 are the yearly anomalies from January 2016 for GISS (NASA Goddard Institute for Space Studies), but GIS5 are the yearly anomalies from January 2015. First of all, I would like to draw your attention to the 2014 and 1998 anomalies as stated last year and as stated this year. Last year, the anomaly for 1998 was 61 and that of 2014 was 68 as can be seen on column GIS5. From column GIS6, it can be seen that 1998 jumped by 2 to 63, but 2014 jumped by 6 to 74. And 2013 jumped by 5, but 2002, which did not make the new cut of the top 10, only jumped by 3. And you know what this does to the “pause” from 1998 to 2015 when later years are bumped higher than earlier years. Next, I will discuss some implications of GIS5. You may recall the controversy last year when GISS said that 2014 was a record warm year, but later said that there was only a 38% chance that it was really a record. The reason for this was that the error bar for each year’s anomaly is about 0.1. Two things can be pointed out in this regard from GIS5. The 2010 anomaly was only 0.02 lower than that of 2014. This meant that 2010 had a pretty good chance of being the warmest, although by a lower percent than 38%. As well, the anomaly for 2014 was 0.68 whereas the anomaly for the 10th ranked year was 0.59. This difference of 0.09 was less than the error bar, so even the tenth ranked year had a statistical chance to be the warmest, although the probability would have been very low. So while 2014 had a greater chance to be the warmest year than any other year, the cumulative total of each of the next nine years being the warmest was about 62%. Things are way different this year! Check out the 2015 anomalies for HadCRUT4, Hadsst3 and GIS6. In particular, note the difference between 1ano and 2ano for these three data sets. In all three cases, the difference is more than 0.1. This means that the probability that 2015 is a new record is over 90% in each case. It happens to be 94% for GISS. In contrast, check out the anomalies for the two satellite data sets, UAH6.0beta4 and RSS. Specifically, compare the 2015 values at “3ano” with the 1998 values at “1ano”. The difference is way more than 0.1 indicating there is a much greater than a 90% chance that 2015 is NOT a record for the satellite data sets. If we assume an error bar of 0.1, then even second place is outside this error bar for HadCRUT4, Hadsst3 and GISS. However it is different with the satellites. If we assume that the UAH anomaly of 0.266 could be as high as 0.366 and as low as 0.166, then its third place ranking could be as high as second or as low as seventh. If we assume that the RSS anomaly of 0.358 could be as high as 0.458 and as low as 0.258, then its third place ranking still cannot be higher than third but it can be as low as sixth. It is not shown anywhere either on the above table nor on the table in section 3, but the November and December anomalies on all five data sets showed records for November and December. As well, many other months showed monthly records for some of the data sets. As can be seen in section 3, all time records were set by HadCRUT4, Hadsst3 and GISS. For HadCRUT4, its December anomaly of 1.005 beat the previous all time high mark of 0.832 set in January 2007. For GISS, the December anomaly of 1.12 beat the previous all time high January 2007 anomaly of 0.96. For GISS, October and November also beat the 0.96 mark with 1.06 and 1.05 respectively. 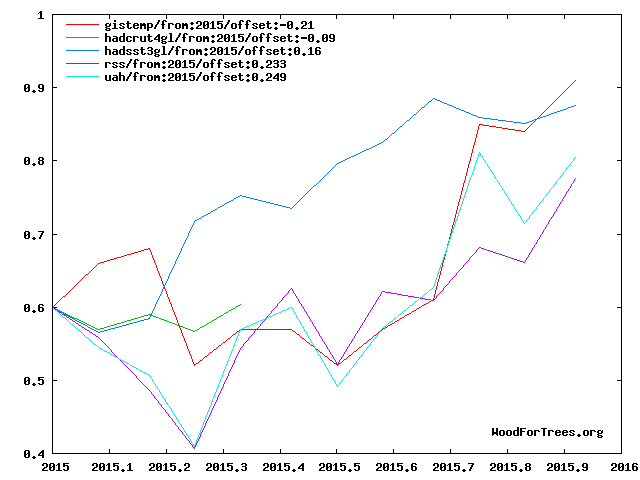 For Hadsst3, its September anomaly of 0.725 beat the mark from August 2014 of 0.644. As for the two satellite data sets, despite record warm monthly Novembers and Decembers, they were no where close to beating their all time high April 1998 anomaly. However if 2016 is patterned after 1998, the April 1998 record could fall. What will happen to the present RSS pause of over 18 years? It all depends on how high and for how long the RSS anomalies stay high. If the RSS anomalies drop to 0.25 from the present 0.543 over the next three months, the pause will remain over 18 years. But if they stay high, then the pause may either drop to 15 years or to 7 years or it may disappear entirely. If the pause does disappear, it would take a La Nina to revive the pause again to over 18 years. In the sections below, as in previous posts, we will present you with the latest facts. The information will be presented in three sections and an appendix. The first section will show for how long there has been no warming on some data sets. At the moment, only the satellite data have flat periods of longer than a year. The second section will show for how long there has been no statistically significant warming on several data sets. The third section will show how 2015 so far compares with 2014 and the warmest years and months on record so far. For three of the data sets, 2014 also happens to be the warmest year. The appendix will illustrate sections 1 and 2 in a different way. Graphs and a table will be used to illustrate the data. This analysis uses the latest month for which data is available on WoodForTrees.com (WFT). All of the data on WFT is also available at the specific sources as outlined below. We start with the present date and go to the furthest month in the past where the slope is a least slightly negative on at least one calculation. So if the slope from September is 4 x 10^-4 but it is – 4 x 10^-4 from October, we give the time from October so no one can accuse us of being less than honest if we say the slope is flat from a certain month. 1. For GISS, the slope is not flat for any period that is worth mentioning. 2. For Hadcrut4, the slope is not flat for any period that is worth mentioning. 3. For Hadsst3, the slope is not flat for any period that is worth mentioning. The next graph shows just the lines to illustrate the above. Think of it as a sideways bar graph where the lengths of the lines indicate the relative times where the slope is 0. In addition, the upward sloping blue line at the top indicates that CO2 has steadily increased over this period. Note that the UAH5.6 from WFT needed a detrend to show the slope is zero for UAH6.0. The actual numbers are meaningless since the two slopes are essentially zero. No numbers are given for CO2. Some have asked that the log of the concentration of CO2 be plotted. However WFT does not give this option. The upward sloping CO2 line only shows that while CO2 has been going up over the last 18 years, the temperatures have been flat for varying periods on the two sets. On several different data sets, there has been no statistically significant warming for between 6 and 22 years according to Nick’s criteria. Cl stands for the confidence limits at the 95% level. This is 22 years and 11 months. This is 22 years and 8 months. This is 14 years and 10 months. This is an even 20 years. This is 6 years and 9 months. This section shows data about 2015 and other information in the form of a table. The table shows the five data sources along the top and other places so they should be visible at all times. The sources are UAH, RSS, Hadcrut4, Hadsst3, and GISS. 1. 14ra: This is the final ranking for 2014 on each data set. NOTE: These are prior to 2015. See the first table in this post to see how 2015 has affected the 2014 rankings. 2. 14a: Here I give the average anomaly for 2014. 3. year: This indicates the warmest year on record so far for that particular data set. Note that the satellite data sets have 1998 as the warmest year and the others have 2014 as the warmest year. 5. mon: This is the month where that particular data set showed the highest anomaly. The months are identified by the first three letters of the month and the last two numbers of the year. NOTE: These numbers are all prior to 2015. 7. y/m: This is the longest period of time where the slope is not positive given in years/months. So 16/2 means that for 16 years and 2 months the slope is essentially 0. Periods of under a year are not counted and are shown as “0”. 9. sy/m: This is the years and months for row 8. Depending on when the update was last done, the months may be off by one month. 10. Jan: This is the January 2015 anomaly for that particular data set. 11. Feb: This is the February 2015 anomaly for that particular data set, etc. 22. ave: This is the average anomaly of all months to date taken by adding all numbers and dividing by the number of months or by using the numbers in the data sets. 23. rnk: This is the rank that each particular data set has for 2015. For UAH, version 6.0beta4 was used. Note that WFT uses version 5.6. So to verify the length of the pause on version 6.0, you need to use Nick’s program. To see all points since January 2015 in the form of a graph, see the WFT graph below. Note that UAH version 5.6 is shown. WFT does not show version 6.0 yet. Also note that Hadcrut4.3 is shown and not Hadcrut4.4, which is why the last few months are missing for Hadcrut. For RSS: There is no statistically significant warming since May 1993: Cl from -0.030 to 1.574. The RSS average anomaly for 2015 is 0.358. This puts it at 3rd place. 1998 was the warmest at 0.55. The highest ever monthly anomaly was in April of 1998 when it reached 0.857. The anomaly in 2014 was 0.254 and it was ranked 6th. The UAH average anomaly for 2015 is 0.266. This would rank it at 3rd place. 1998 was the warmest at 0.482. The highest ever monthly anomaly was in April of 1998 when it reached 0.742. The anomaly in 2014 was 0.184 and it was ranked 5th. The slope is not flat for any period that is worth mentioning. For Hadcrut4: There is no statistically significant warming since March 2001: Cl from -0.031 to 1.650. The Hadcrut4 average anomaly for 2015 is 0.745. This sets a new record. The highest ever monthly anomaly was in January of 2007 when it reached 0.832. This is prior to 2015. The anomaly in 2014 was 0.567 and this set a new record. For Hadsst3, the slope is not flat for any period that is worth mentioning. 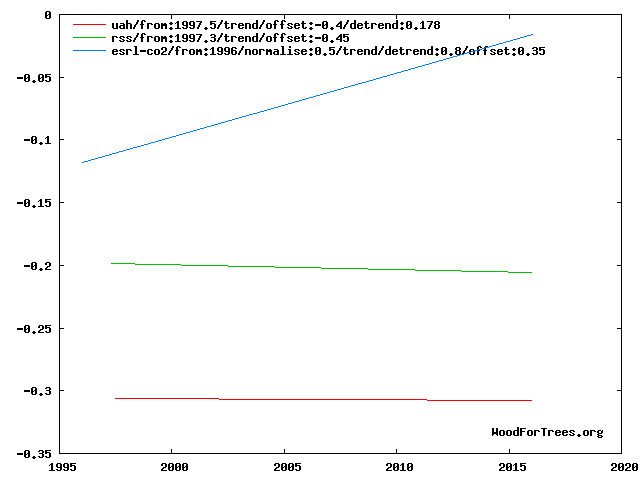 For Hadsst3: There is no statistically significant warming since January 1996: Cl from -0.021 to 2.082. The Hadsst3 average anomaly for 2015 is 0.592. This sets a new record. The highest ever monthly anomaly was in August of 2014 when it reached 0.644. This is prior to 2015. The anomaly in 2014 was 0.477 and this set a new record. For GISS: There is no statistically significant warming since April 2009: Cl from -0.065 to 5.706. The GISS average anomaly for 2015 is 0.87. This sets a new record. The highest ever monthly anomaly was in January of 2007 when it reached 0.96. This is prior to 2015. The anomaly in 2014 was 0.74 and it set a new record. At the moment, the satellite data have not responded as in 1998. 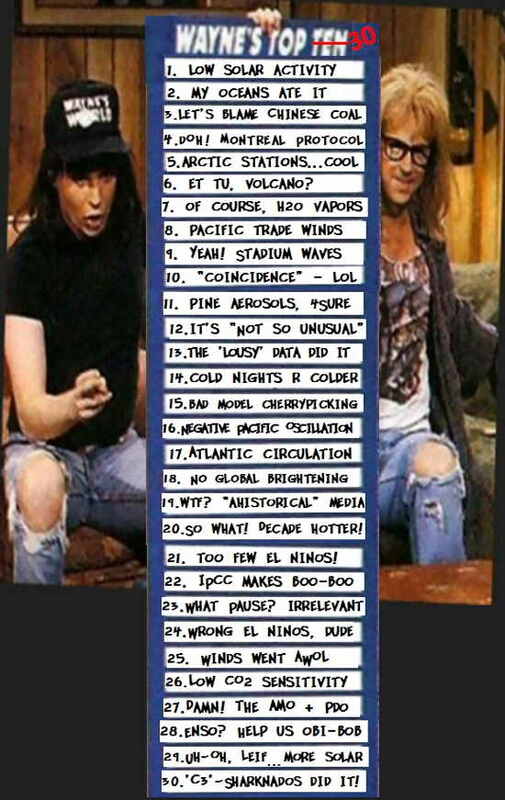 Do you think any 1998 satellite records will be beaten in 2016? In your opinion, how much of the terrestrial records in 2015 were real and how much was due to adjustments? P.S. I thought Senator Cruz was very well informed on climate issues. I recently found out why. The satellite data has been confirmed by thermometers attached to weather balloons. There is no secondary confirmation for the surface based data. From what I have read, when the official temperature-recording station was moved from downtown LA to the UC campus several miles, away a few years ago, There was an abrupt drop in temperature of about 4 degrees. Clyde Spencer, don’t they adjust temperature readings when a station is moved? I wouldn’t be surprised if they adjust current readings upward by 4 degrees to make it consistent with past data from that station. Here is Los Angeles. Looks like a move in about 1975. 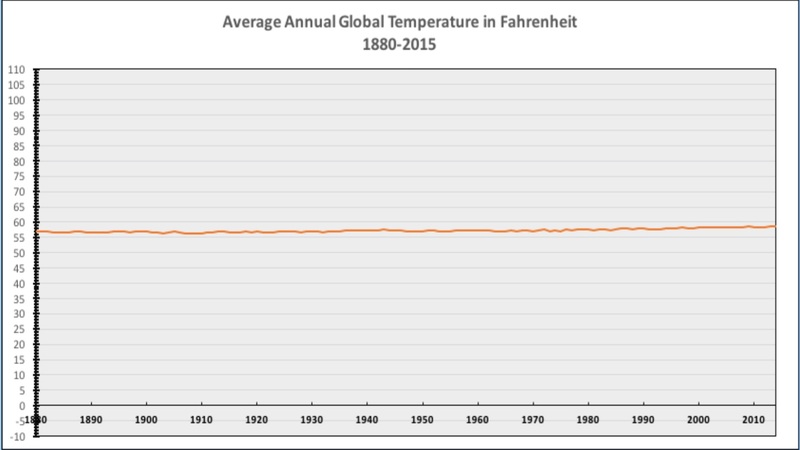 They publish unadjusted and adjusted data – seems the adjustment was about 1.8°C. I understand that the balloon and satellite data are somewhat incestuous – used to calibrate each other. Their exact relationship I expect to hear from someone on this list. It would be good to keep in mind. On the other hand, I tend to trust direct readings of air temperature over the satellite readings for the simple reason that the satellite readings require interpretations which require factors and subtractions for interference. Every single direct measurement of anything has an uncertainty and these uncertainties propagate through to the final answer. The claims to know the average global temperature have to be accompanied by an uncertainty, each and every time. The sizes of the uncertainties provided by GIS are impossibly small for the instruments and data involved. That concerns me. Uncertainties propagate and grow. They never shrink through a calculation. It seems, based on what I can read, that the ‘temperature’ is presented with a small uncertainty, but that the certainty about the size of that uncertainty is quite a bit larger. It is like saying, “2014 was the warmest year evah,” with a certainty of 38%. Well, looking into it, one can arrive at a much lower number than 38%. More like 3%. You get my drift? Suppose you heard, “2014 was the warmest year evah and we are 10% certain a claim of being 38% certain about it can be sustained.” So…the upper bound temperature at some confidence level happens to be above some other statistically generated point. This really is “dancing angels on the head of a pin”. I remind readers that the old ‘angels’ religious argument was not about how many angels can fit onto the area of the head of a pin, it was about whether or not 2 (or more) angels can co-exist – stand – on the point of a pin at the same time. Could they overlap in space and time, seeing as they are angels and all. The temperature claims co-exist in value and time and space (the globe). Multiple claims of convenience all simultaneously exist and are simultaneously true because the truth is uncertain. “The cat is both dead and alive at the same time” (which was always a stupid argument!) While any claim remains uncertain, all claims are valid. They are not ‘partially valid’ based on their uncertainties, they are equally valid because they fall within the realm of ‘possible’ and not disproven. That is why it is important to run down the propagation of errors (uncertainties carried forward) through all the calculations to produce the final answer and its necessary accompanying statement of uncertainty. Thus applying superlatives to an uncertain answer is uncalled for. It is also foolish to make specific pronouncements about ‘warmest years’ when the truth is, we cannot be sure based, on the information we have. The tragedy is that people are spending so much money based on what is written on these intellectually blank pages. Crispin, It is more than mathematical errors and uncertainties, it is geographical distribution of observations, paucity of observation stations, and unvalidated homogenization algorithms. These get easily hidden by mathematical argument. Then there is the unthinking use of the intensive variable ‘air temperature’ as an indicator of heat content, which it isn’t. Stop running away into the realms of mathematics and statistics and playing with ‘hundredths of a degree’ when there are large error factors that are (deliberately) not being assessed at all. I built a computerized system utilizing geostatistical modeling to assist the grade control geologists at a well-known mine in Nevada. Had I used the “homogenization” (aka “fudged”) procedures there that “climate scientists” use on temperature data, I’d expect to be fired. I’ve been reading up on some of those now old climate gate emails. (fascinating stuff). It occurs to me from those emails that there is an important distinction between how satellite and ground based adjustments are used. While Spencer and Christy simply use adjustments to try and get to the truth, the warmist team have already decided the “truth” and use adjustments and the inherent complexity of ground based temperature reconstruction to make the data show the trend they want us to see. It seems to be a balancing act between making it look scary and being able to explain it. What a load of garbage you posted, Sir. First you attack the best temperature data with a totally incorrect and snide comment. This is followed by obfuscation of the highest order about the land based record. …balloon and satellite data are… used to calibrate each other. I don’t think that’s correct. Satellites use the cosmic background radiation temperature of about 2.8K as the primary standard. Radiosonde balloons use PRTs or something similar, IIRC. They corroborate each other, but they don’t use each other for calibration. You’re right about GISS, there have been far too many examples of them “adjusting” the temperature record — and the end result always shows scarier warming. It’s reached the point where we have to conclude they’re lying about it. Aren’t the balloon temperature sensors calibrated in a lab, not with comparisons to the AMSU data? Well, looking into it, one can arrive at a much lower number than 38%. More like 3%. You need to keep in mind that the total percentages of the top 10 or so should add up to close to 100%. So if you assign 3% to the one that is supposedly the warmest, how much do you assign to the the other 9? I prefer the 2 satellite measurements. Why? First they have the greatest coverage. RSS goes from 82.5N to 82.5 S and UAH, 85N to 85S. (correct me if I’m wrong on that point). Second they are the least adjusted. Yes they are based on various items and susceptible to satellite drift etc but those are pretty straight forward and justified adjustments. Lastly they are run by 2 scientists with good credentials (Dr Mears – RSS & Dr Spencer – UAH) with differing views. I like that. Not only does it keep them honest it makes me think and read both sides to see why they are so different in their conclusions despite almost identical data. Dr Mears thinks CO2 does control the climate and Dr Spencer does not. So far I side with the position of Dr Spencer. As for the adjustments, UAH has been criticized for their recent adjustments from 5.6. However since the new 6.0 is in line with RSS, that suggests to me that the adjustments were needed and warranted. 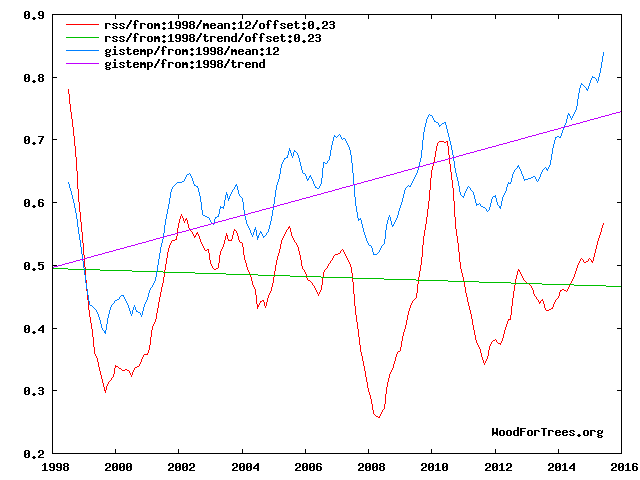 In my opinion, the strongest point is that Mears is pro warming, yet his own data show otherwise. So since both groups have data showing the same thing, even though their warmist philosophies are opposites, that is very convincing. I am convinced Mears has searched high and low to find an error in RSS, but has not been able to do so. I therefore admire his integrity. Notice the leg ups and downs for both data sets in El Nino years. In the satellite data sets this years El Nino had not yet produced as much movement, or as steep of movement as in prior El Nino years. My view is that this is likely due to the AMO moderating and even cooling in the Atlantic, and the blob moderating as well. This leads me to think that the next La Nina may well have amplified movement downward. Currently even the highly questionable surface data set is right in line with Hansen’s’ no emissions scenario “C”. My view is that this is likely due to the AMO moderating and even cooling in the Atlantic, and the blob moderating as well. You may be right, however it is also possible that the peak has not been reached yet which is what I suspect now. The new 4 months will tell. It would be a good idea (not an assignment, but a request) to display a chart that shows what CAGW theory says the satellite trend should look right now with a trend 20 percent greater than the surface. My computer abilities are limited to what WFT lets me do. So I can plot GISS from 1998 to date, draw a trend line, then draw another trend line with a 20% greater slope. So basically, my top graphic would have a trend line ending at 0.8. In fact adding another line showing the IPCC dangerous .2 degrees per decade warming in the troposphere would really illustrate the difference between the predictions, and the observations. Lord Monckton’s monthly articles cover this sort of thing well. And then Dr. Spencer did what every scientist should do, namely examine your own work to see if you have made an error. Land based thermometers are not even verified or certified for accuracy when they’re installed! Faulty or dirty stations are not tested for levels of error before getting replaced by uncertified thermometers (thermistors). That leaves land thermometers assuming the mantle of laboratory accuracy in their error claims, rather than legitimate test results. Filled in data is smudged from inaccurate uncertified thermometers up to 1200 Km away. Oh yeah, NOAA is just full of ‘scientists’; just not working on temperature. Distance-weighted averaging or interpolation is valid for smoothly changing variables. However, when a cold front moves through there is a high temperature-gradient associated with a line moving across the region and all bets are off! Yet, apparently, the interpolations are done anyway. Where are the detailed studies evaluating each ‘distance-weighted averaging or interpolation’ pair of temperature stations demonstrating validity and establishing error rates!? None performed? Then any such averaging or interpolation is nothing more than palm reading or entrails scrying. This is well before considering latitude alignments, altitude equivalence, land form/use similarity, ocean breezes, mountain breezes, desert breezes, and a multitude of other proper considerations for assuming two stations have a temperature relationship. As stated so often here; GIGO, Garbage in, garbage out. Interpolations are done for monthly average anomalies, which are indeed smoothly varying. A cold change doesn’t have an effect on that scale. The Balloon Radiosonde data from 2011 on does not confirm the satellite data. The Balloon data shows much more warming over the past 5 years. The entire attempt to fine tune the mish mash of data for various points on the planet to get a ‘global temperature’ is…IMPOSSIBLE. We get a general idea of warmer or cooler which is also very spotty and only gross differences in temperature are visible that is, we go from very nasty long Ice Ages to short melt periods that always end in another Ice Age over and over again. Tracking tiny changes in our Interglacial conditions is a fool’s errand. We still don’t know for certain how Ice Ages happen or why we just know they do happen and will happen again and this means the yelling about how we are going to roast to death is foolish when over our heads looms a future Ice Age since we are most definitely on the downslope from the highest warmth of the present Interglacial. But lots of people get funded to talk about tiny permutations in ‘planet climate’ so this charade will roll onwards until the money runs out or all of Canada and the Great Lake states are buried suddenly under a mile of ice again. I wonder if that strange gap is simply UHI, which is ignored by Schmidt and the gang. Most of the gap is from molestation of SST data I believe. 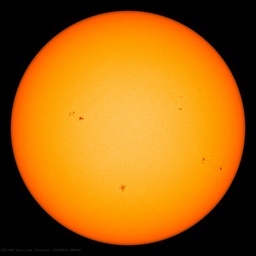 not ignored at all, it comes in very handy when it is smeared over the globe to enhance the warming trend. Yes Werner, and I’ve been bleating away over the past few months that we will see a dramatic adjustment to the satellite data, too, at least RSS. Once RSS is diverging away from UAH, the pause buster will be fait accompli. The recent silly 10 minute video was a trial balloon to see how much outrage it would provoke. These guys have been emboldened by basically getting away with climategate by simpleton rationalizations. They have been emboldened by investigations that were whitewashes of the first order. You see, they expect we will slice and dice their efforts but experience has taught them that we few don’t matter. We are easy to marginalize. The hatchet job they did on Christy and Spencer, the mighty inventors of the satellite method of measuring temperature is the tell (the giveaway). They have been out to get these guys for decades. They have long ago been outsiders. Meares who is with the team and who manages RSS has been under pressure from his warming proponents and he has gone on record extolling the surface thermometric record and saying satellites are actually not measuring the ground level directly anyways. Meares has been helpless in that he is paid by NASA to put the RSS stuff out there. That’s his job. I can tell you that the next step will be to adjust RSS up because of satellite drift or some newly discovered cooling effect in the satellite that ‘needs’ a correction. It’s easier to do now because of their confidence in such matters. He’s been agonizing over the pain caused by his complicit work with UAH and I’m sure he’s been looking for a reason. I believe he has found a convoluted reason at long last. My link for this information is I’m an old poker player as was my father. Who knows what Mears might do? Had he adjusted his data a year ago to agree with UAH5.6 at the time, there would have been a lot of credibility to the move. However now we have UAH6.0beta4 which closely agrees with RSS. So if RSS makes a move now to go away from UAH6.0, that would REALLY look suspicious! I too have noticed that Mears has generated a new Climate Inc., meme, that the satellites aren’t measuring the atmosphere close to the surface. This has propagated throughout the climate cult and some are even confused by the RSS page into thinking that the satellites are measuring a flat plane about 50,000′ altitude. I doubt there will be any quasi-scientific adjustment they can get away with that will hide the cooling after the ensuing La Nina. The curve of radiosonde-reported warming rate vs. altitude indicates that the surface-adjacent troposphere warmed at a rate of .02, maybe .03 degree/decade more than the satellite-measured lower troposphere during the period of satellite measurements. This sounds suspiciously like the (sadly) common fallacy- we know the warming is somewhere, therefor it must be where we’re not measuring very robustly. This is how the newer models start developing crazy hot spots all over the places on earth with the least thermometers. Because- they have to. Why aren’t the warmistas attacking the satellites for their denialism? Way off topic but..can one of you sci-ency persons explain this to me ?? I know it’s faked, but can’t figure HOW ?? Maybe this is how the ” Warmista’s ” fool the masses !! True! But the answer is simple. At first you see 6 cards. At the end, you see 5 cards, but all five cards are different than any of the 6 you saw before. So naturally the card you thought about is not there, regardless which one it was. In other words…simple dishonesty !! “Simple dishonesty” – another one of nature’s tricks – simply modeled. Thank you! In my opinion, all three deserve to be posts on their own. However I have no say in this matter. FIRST CLASS ANALYSIS (as always), O Data Expert Extraordinaire — with stylistic and even comedic flair! Your taking the time to respond so thoughtfully throughout this thread proves, once again, that you are world class. The long hours (completely uncompensated) you devote to science truth, thus, freedom, prove you to be a fine man, indeed. Wow …. you nailed it. Your analysis clearly shows why the surface data product from GISS is junk. Nice job. Sorry! That “Thank you” should have been to Okulaer if that can be passed on. Thanks! Kristian….saw Werner’s comment and decided to check your links. Read the 1st one – Holy Smokes Batman. Well, purposeful deception is a Lie in any language. For the people that want to meet these liars halfway to engage in discussion, etc. is a waste of time and intelligence. They play hardball and our side is slow-pitch (though our side doesn’t have the gov’t money or media). If you want to win a righteous war, you have to get your hands dirty. Thank you, Kristian. The ToA radiation fluxes piece is very interesting. The GISSTEMP-LOTI v. UAHv6 piece is very clearly stated. Now that the OCO satellite is up, I wonder if if it is possible to compare the OLR data w/ the somewhat non-homogenous CO2 concentration data to see if there is a CO2 signal in the OLR data. I tend to doubt the spatial and w/m2 resolution is sufficient. and surmise that the CO2 signal would be drowned by conviction, clouds, etc., but I am just a caveman and these things are hard for me. This has actually been demonstrated by Feldman et al (2015) and Gero/Turner et al (2011). The Feldman paper identifies a clear CO2 IR signal with our increasing emissions and the Gero/Turner paper shows that the total IR signal is unchanged. Hence, negative feedback has been experimentally demonstrated. Surface and near surface energy / thermal flux combined with albedo mods have got to be the culprits. Every new cool ap begets another server farm, etc, etc. It seems possible that both the satellites and surface thermometers could be substantially correct. All the light emitted by the surface in the strongest CO2 bands was completely absorbed at preindustrial levels. These strongest bands continue to absorb and thermalize, but additional CO2 produces no further increase in net thermalization in these bands. The first transition from the ground state at wave number 667.4 is an order of magnitude stronger than the next strongest transition and it is thought to be extinct at 3 meters above the surface. The surface thermometers are about 1.5 meters. If increasing atmospheric CO2 were to lower this intense thermalization, the surface thermometers would record a rise in temperature and the satellites would be unable to see any difference. Gymno; this is a very interesting graph but I do find it a bit confusing. Could you please describe what it is showing in a bit more detail and in simple terms. I think I understand what you are saying about the 1.5 vs 3m readings but am a bit unclear just what the green and blue traces are showing and how to interpret this data. (eg. Where is most of the absorption between approx. 625 and 710 taking place…is this water, CO2, CH4 or what?). 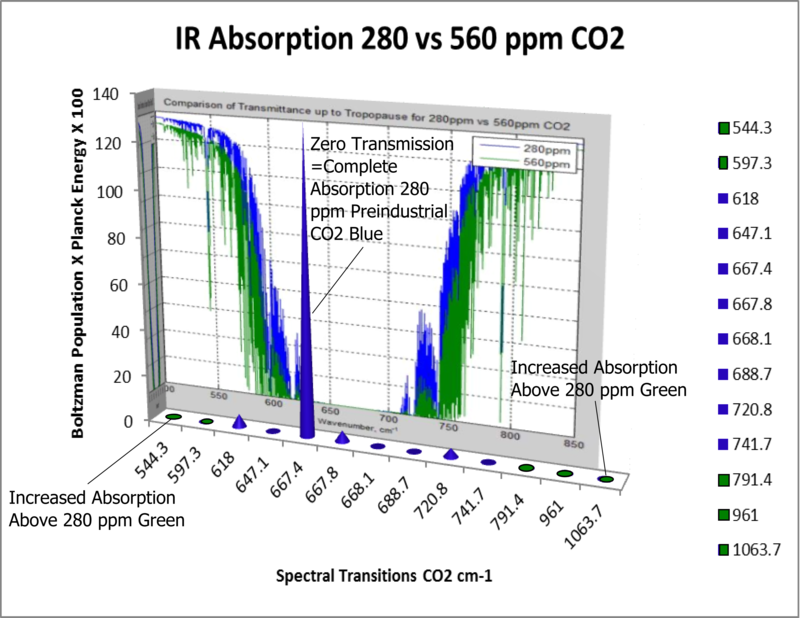 Are all CO2 absorption bands fully “used’ at 280ppm and what are these wavelengths? I’ve heard the ‘extra layer of paint’ analogy for the (minimal) effect of increased CO2 but is this valid? What is written on the thin graph just below and to the lower right of ‘140’ and to the left of ‘Comparison’ on the vertical axis…I can’t read it on my screen…is there a higher res version? Is it the sum of all the transmisson cones? Am I correct in assuming the numbers on the x axis are in nm?So many questions, so few answers!! I really want to understand this graph. X axis is wave numbers in inverse centimeters, but it could equally be microns or nanometers. The blue cones are zero transmission to the tropopause at 280ppm or preindustrial atmospheric CO2. Adding more CO2 as we have done does not further decrease transmission because it was already zero at 280. The green ovals (they would be cones but they are too weak to get off the ground) are transitions where additional CO2 does further decrease transmission and therefore produces net warming. The graphic is strictly about the atmosphere. The background picture may include standard atmosphere parameters besides CO2, but the transition wavenumbers and cones are just for CO2. The intent of this graphic is to show the relative intensities of the transitions in the context of transmission which accounts only for the portion (expressed 0 to 1) of the wavelength that makes it from the source at the surface through the atmosphere irrespective of its energy. The enormous disparity in energy between that first transition and all the others seems not well appreciated. I believe this helps explain not only why surface thermometers show a much higher trend than the satellite sounders, but why CO2 does not perform as expected in the models. And, remember, C02 absorbs only ~8% of all LWI. The satellites cost a fortune to be built and put into space. Obviously it was a complete waste of money. If Cruz or Trump become president, some people may get fired, but it will not be satellite people. I also thought Senator Cruz was very well informed on climate issues. His staff is an avid reader of WUWT and other credible climate blogs. See the postscript of the original post. Variation in the vicinity of tenths of one degree C over 15 years and people are arguing about it? Doesn’t anyone hear think the “ten minute”, polished video by the team is more sinister than it appears? This is from Yale Climate Connections. The pause has been under heavy attack – first by ~60 explanations for it by the climate teamsters. Santer himself said a few years ago they would only worry about the theory if the pause surpassed 17 years [an earlier deadline of 15 years was surpassed]. These guys haven’t been doing much climate science since, but rather have spent most of their time trying to neutralize the pause, which is like the grim reaper to their science and livelihoods. Trenberth (travesy we can’t explain lack of warming) began it with his hot spots randomly zig zagging over the surface of the earth and then that the warming was hiding 10,000 leagues under the sea. After T. Karl’s bold erasing of the surface temperature pause, which by the way was roughly paralleling the UAH, RSS, even though some tenths higher, do you think the bastion of satellite temperatures is not on the block? I can’t seem to convince anyone that there is a big change coming to this stubborn data set, at least RSS’s. They see no problem of this set being adjusted away from UAH, the keepers of which they already have vilified and ridiculed and re-harpooned in this little video. The hurry-up will be because they are worried about the following La Nina that they have to get ahead of. I expect the present pause on the satellite data to disappear within 3 or 4 months and then perhaps reemerge a year later. Should this happen, there is no need for the RSS people to do anything for a while. I have a question and a theory that might amount to nothing. Question: When they make adjustments to the ground-based data, does that include adjusting for changes to station altitude? In a perfect world, this should not be necessary. But as all know, many stations were removed and new ones added through the past 150 years. 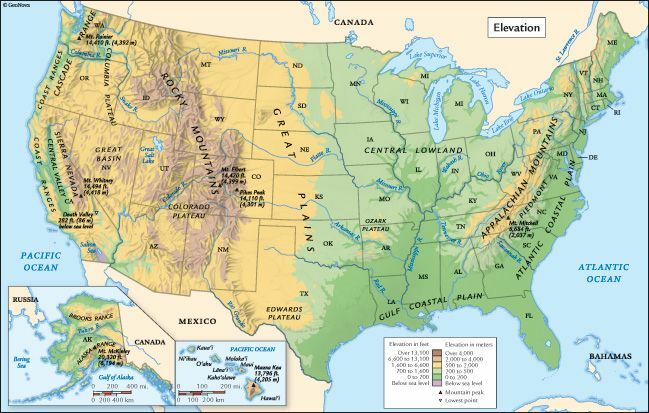 So for example if a station was being used in the Rocky Mountains in my home state of Colorado between 1910 and 1980, got taken down in 1981 and replaced with (or just giving more weight to) a low elevation in Denver, and both used to calculate the trend for the same grid-box, there would be significant spurious warming shown for parts of Colorado east for the front range. .
1. As I understand it, some people have claimed that the warmists have systemically taken down stations at high latitudes and altitudes in the late 20th century. I have no idea if this claim is truthful. But the claim is there nonetheless. 2. After staring at some geographical maps until my eyes bleed, it occurs to my that the areas with the most warming in the US match closely with areas that might shown spurious warming from the above theory. The red areas also have many LDS living in them. Lots of residential growth in them thar parts. A couple years ago the entire alarmist contingent accepted the so-called “Pause”. But now they’re just lying about it by saying it never happened. P.S. Dart throwing generally happens once a week. This growing discrepancy is getting out of hand. The fraudulent and blatant manipulation of land based temperature records with the sole purpose of creating virtual warming is a growing scandal that should be sending the more guilty people involved to prison. How can anyone make informed decisions on made up data?? The next big thing no doubt will be a ‘correction’ of the satellite records. Based on nothing more scientific than than global warming is true therefore by definition the satellites are wrong. That’s #13. Might happen any night, now. But, not next week — that’s Piñata Week! The discrepancies between the various sources of global temperature anomaly estimates is probably more an indication of the uncertainty in the estimates than anything else. The uncertainty in these estimates are probably at least around 0.3C to 0.5C in recent decades and increasingly higher as you go back before the satellite era. That means we can only say 2015 was among the highest estimated global annual temperatures, but we can’t say it was the highest with any real confidence. Most people don’t realize that the estimated global temperature varies by about 4C from the lowest temperature in January to the highest in July. See the graph below that shows 2015 in comparison with 1981-2010 based on CFSR data. The monthly and annual global temperature anomalies are quite small compared to the seasonal pattern. Here’s what the trend since 1979 looks like with the monthly CFSR global temperature estimates. I posted more about it here if you are interested. Most people don’t realize that the estimated global temperature varies by about 4C from the lowest temperature in January to the highest in July. The January trend is +0.0134C per year which corresponds to +1.34C per century if maintained, while the July trend is slightly lower at +0.010C per year which corresponds to +1.00C per century. That is good news! What is there to worry about if the coldest month warms the most? Werner, yes I remember that post. Working with anomalies hides a lot of information. Even if there is a little warming of 1C or even 2C above current global temperatures, that’s still fairly small compared to the 4C seasonal variation. And I agree, a little warming and more CO2 are probably net beneficial for earth and humanity all things considered. Warming is certainly preferable to cooling and might even help delay the next glacial period, which looks like a high probability based the regular glacial cycles of the last million years. But it will probably take 10 or 20 of thousand years for global cooling to have big impacts as earth moves into the next glacial period, so no worries any time soon. Here is a persistence forecast based on the EPICA ice core proxy. All the OP chart proves is, that If 1998 were one or the warmer years, 2017-18 should be colder ones. As for the variance effecting local climates in any significant form the verdict has been rendered. That when they start growing wine grapes in England again we will have cheaper wine, is all good! What would it take to kill the RSS pause? “If the January anomaly exceeds about 1.3°C, the Pause is gone. This is unlikely. “What would it take to kill the new narrative that there was never any ‘pause’? Even a year ago the alarmist crowd acknowledged that global warming had stopped. And not just “paused”, but it has beenstopped for many years. But they’ve moved the goal posts, as usual. Now, they claim there was never a pause in global warming at all! The problem isn’t with science. The problem is with the immense flood of federal grant money that supports the false alarmist narrative. At this point they’re lying in order to protect their grant gravy train. Now they are simply lying outright, by claiming that global warming (and by implication, ‘dangerous man-made global warming’) is chugging along as always. Providing RSS does not change their data like NOAA and GISS and Hadcrut4 have done, it can always be claimed that RSS had a pause of 18 years and 9 months at one point and which may have ended at some point in the recent past. And it could still be shown at a later date that we in fact did have a pause of 18 years and 9 months from March 1997 to November 2015. However if adjustments are made to RSS in such a way that 2015 is warmed more than 1998, then nothing can be proven later. As you know, we are often accused of cherry picking our start date to before the 1998 El Nino. I do not agree with that argument due to the La Ninas that followed. However we can always claim in six months from now, for example, that if BOTH the 1998 and 2016 El Nino are not counted, then we still had a pause of at least 15 years. These Adjustments, can they be applied to the raw data in reverse? obviously they would produce a great deal of cooling and warm the past but I would really like to see the stark difference between a cooling trend adjustment and a warming trend adjustment of the same value because any adjustment to the raw data obviously falls into a margin of error, so the larger the raw data adjustment in any direction, then the greater the margin of error will be… I’m sure this has to be correct! These Adjustments, can they be applied to the raw data in reverse? Let me put it this way: If GISS never made any adjustments over the last 20 years, our warming rate over the last 20 years would probably be half as much and would not be considered dangerous by anyone. But if all adjustments over the last 20 years were reversed so that if 0.06 were subtracted from 2014 instead of added as was done in 2015 for example, we would probably have no change over the last 20 years in my opinion. In other words, what we are seeing here could be outright fraudulent misrepresentation and manipulation of the true data. By analogy, in a criminal law context manipulation of data might equate to tampering with evidence. If tampering is proven against tamperers, they usually get sent to gaol…. If tampering is proven against tamperers, they usually get sent to gaol…. I believe Lamar Smith and another group were actually looking into this, but we have nothing provable so far. Could you explain how you calculated your off-setting figures in the WfTs charts please. You say that they are all set to start in January 2015. Does this mean you have taken that single month as the basis for the anomaly or did you use the year, etc? I have been unable to replicate the figures. Could you explain how you calculated your off-setting figures in the WfTs charts please. If you want them to start at a nice round number like 0.60, then all may need a different offset. Just see how far each January is away from 0.60 and apply the offsets accordingly. What you have described above is ‘not’ the normal way to offset one data set against another. The whole idea of offsetting is to pit one data set against another so that they can be compared across a common long term period of reference. For instance, re your first chart above, we can compare RSS and GISS since 1998 against a common long term reference period, say 1981-2010. To do this, we just need to calculate the average temperature anomaly in RSS between 1981-2010 (currently 0.10 C) and that in GISS over the same period (currently 0.43 C) and deduct these as ‘offsets’ from the best estimate values in each respective set. What I described to you was based on how I got all points to start at the same place in Section 3 of the report. As for the top graph at the start of the post, I used the starting points of the slope lines and then had them start at the same place. WFT gives those numbers as well. The baseline was never on my mind at all. What you have described above is ‘not’ the normal way to offset one data set against another. It’s all very interesting and confirms the weaknesses in the AGW case, but I think we need to move the debate on from its this number or that number. Essentially, a global average temperature is a meaningless, statistical construct pushed by the Alarmists and their emphasis upon it is probably why their case is failing. In the non-academic and non-political world of day-to-day life it actually means absolutely nothing – and most people know that: it’s just a number debated by life long academics whom in the non-academic world are not actually deemed to be especially significant to day-to-day life. No-one can plant by it, build by it,design for it, farm by it or anything. It’s just a number. I think if we moved the debate away from arguing about whether it’s 1 or 1.5 to what most people experience, I.e. It changed temperature by 15C in Melbourne in 30 mins (from 40 to 25C) and we’re all still alive so how can 1.5C global average over a century be in any way meaningful, then the sceptical case would be even stronger and grounded more in what people experience every day. And even if it is zero, the most important thing is that all people adapt and prepare for what they are likely to be experiencing, whether it is cold weather or tornadoes or whatever. I’m just waiting for the announcement that January was “the hottest month on record”! All the snow and deaths from hypothermia already suggest it! I’m just waiting for the announcement that January was “the hottest month on record”! GISS is on track to beat its December mark of 1.12. And RSS, at 0.543, can certainly beat January 2010 which was 0.587. However RSS will not beat its all time high of 0.857 from April 1998.
a very thorough and professional analysis of the temperature data. thank you. however, it should be said that the AGW issue is not about temperature but about the correlation between temperature and fossil fuel emissions and between atmos CO2 and fossil fuel emissions. First, you need to produce measurements quantifying the fraction of AGW out of all global warming. And according to several media darlings, heat is now a different kind of heat. Instead of rising, it sinks. Sort of a kind of heavy heat. And it hides from human detection. Like a 3 year old hiding from mommy after she discovers a mess in the kitchen. And it causes cold too. This heat even knows how to snow. Heavy, moody heat. Which is why these media darlings tell us we shouldn’t like it. We need to like light, happy heat. The kind that rises and doesn’t make a mess in the kitchen. Can I get a grant to study the differences between heavy moody heat, and light happy heat? Should both RSS and UAH reveal 2016 to be the warmest year on their records would you accept that it really was? I would provided neither one came out with a “Pause Busting” paper like NOAA did last year. However let us suppose that both show that 2016 is 0.10 warmer than 1998. With presumably equally strong El Ninos as a trigger, then 0.10 over 18 years is 0.55 per century. So if that should be the case, the next question to ask ourselves if this is cause for alarm. Thanks for the reply Werner. I agree that if 2016 is 0.10 C warmer than 1998 then the trend in the lower troposphere data *from 1998* would be in the region of 0.5C per century. However, is there any particular reason to favour an 18 year trend above, say, a 30 year trend? Surely 30 years provides us with a much wider range of natural variability than 18 does. That’s the reason 30 years is the WMO’s recommended period for ‘climatology’. Taking a 30 year trend and assuming that 2016 turns out to be 0.10 C warmer than 1998, then warming rate per century more than doubles from 0.5 C to 1.3 C (RSS). A warming rate of 1.3 C per century in TLT isn’t so far removed from the 30 year warming rates seen in the surface data over the past 30 years; that’s without taking into account the much wider error range in the satellite data. However, is there any particular reason to favour an 18 year trend above, say, a 30 year trend? The reason I said 18 is that this is from 1998 to 2016 and compares like with like, El Nino to El Nino. However the 30 year trend starts in a neutral year in 1986 and would end with an El Nino year so you would be comparing apples and oranges. Well, you could. But while 1997 averaged 0.102°C, 2015 was 0.356°C, 0.25 higher. Or to put it another way, from 0.1 in 1997 RSS rose to 0.55 in 1998. 2015 is already closer to 1998 than 1997. Okay, but the 30 year trend is a ‘rolling’ reference period. It advances 1 year (or even 1 month) at a time both at the start and finish periods. That’s what keeps it dynamic. I’ve noticed over the years of my taking an interest in this that the rolling 30 year trend tends to stay quite consistent in all the global temperature data sets, surface and satellite. They are well within one another’s error margins. Within a few hundredths of a degree per decade of one another. This applies whether we start and finish in an el Nino, la Nina or neutral period, which is why the 30 year period is useful. It smooths out the natural variability; be it warming or cooling. 2015 is already closer to 1998 than 1997. True. The question now is whether the quieter sun and other things will cause 2016 to be a repeat of 1998. I’ve noticed over the years of my taking an interest in this that the rolling 30 year trend tends to stay quite consistent in all the global temperature data sets, surface and satellite. This raises an interesting question. Namely if an 18 year trend would be much worse. I can certainly see that a 1998 El Nino could have a huge affect over the next 7 years for example, but after 18 years, the talk of an El Nino at the start gets rather irrelevant I would think. Yes, I saw that – it will be interesting to see what happens. But 2016 does start from a higher base. Though it’s looking as if Jan 2016 won’t be very much higher than Jan 1998. That is because of a dip in the last few days. I hasten to add that that last comparison was for surface temp. I’d expect a bigger difference in RSS. Though it’s looking as if Jan 2016 won’t be very much higher than Jan 1998. From Ch 6 on the UAH site, it looks as if the satellites might be close to January 2010, but this correlation is rather poor. That would also mean a small increase from December 2015. Hopefully we will know by Monday. Well, Jan 2016 close to Dec 2015 for surface (NCEP/NCAR) was my data point. And in RSS, Dec 2015 was close to Jan 1998 (pic here). But as in my afterthought, I don’t think the cross-comparison is right. Yes, it started in mid 1997. I am not sure about my next month’s post, but a comparison and discussion of January 1997, December 1997, January 1998, January 2015, December 2015 and January 2016 might be interesting.